The use of gradient information is well-known to be highly useful in single-objective optimization-based image registration methods. 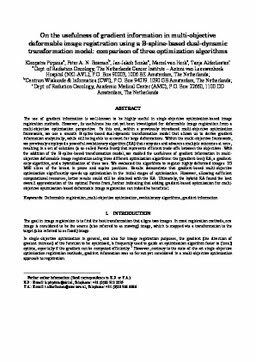 However, its usefulness has not yet been investigated for deformable image registration from a multi-objective optimization perspective. To this end, within a previously introduced multi-objective optimization framework, we use a smooth B-spline-based dual-dynamic transformation model that allows us to derive gradient information analytically, while still being able to account for large deformations. Within the multi-objective framework, we previously employed a powerful evolutionary algorithm (EA) that computes and advances multiple outcomes at once, resulting in a set of solutions (a so-called Pareto front) that represents efficient trade-offs between the objectives. With the addition of the B-spline-based transformation model, we studied the usefulness of gradient information in multiobjective deformable image registration using three different optimization algorithms: the (gradient-less) EA, a gradientonly algorithm, and a hybridization of these two. We evaluated the algorithms to register highly deformed images: 2D MRI slices of the breast in prone and supine positions. Results demonstrate that gradient-based multi-objective optimization significantly speeds up optimization in the initial stages of optimization. However, allowing sufficient computational resources, better results could still be obtained with the EA. Ultimately, the hybrid EA found the best overall approximation of the optimal Pareto front, further indicating that adding gradient-based optimization for multiobjective optimization-based deformable image registration can indeed be beneficial. Pirpinia, K, Bosman, P.A.N, Sonke, J.-J, van Herk, M, & Alderliesten, T. (2015). On the usefulness of gradient information in multi-objective deformable image registration using a B-spline-based dual-dynamic transformation model: comparison of three optimization algorithms. In Proceedings of SPIE Medical Imaging 2015. SPIE.